Holy cats, it's the end of May already. When did that happen? How did that happen? My Memorial Day weekend wasn't quite as reading-and-relaxing focused as I'd have wanted it to be; my mom finished the last of her move on Friday, and I've spent the weekend playing catchup on things in my own house (hellooooo laundry); squeezing in some very hot and humid mileage (including an impromptu 5K this morning that resulted in a new PR! ); and generally trying to regain my sense of sanity. Some of that recovery did include books: I finished Mr. Splitfoot after sleeping in a bit on Saturday morning (what a strange, incredible book) and have had The Nest going on my headphones as I run errands and do chores around the house here (I'm really enjoying it so far--definitely worthy of its summer buzz). I wrapped up the tail end of Just Mercy last week--just in time to pick up The Long Shadow of Small Ghosts this week for the June edition of the Social Justice Book Club (won't you join us!?). 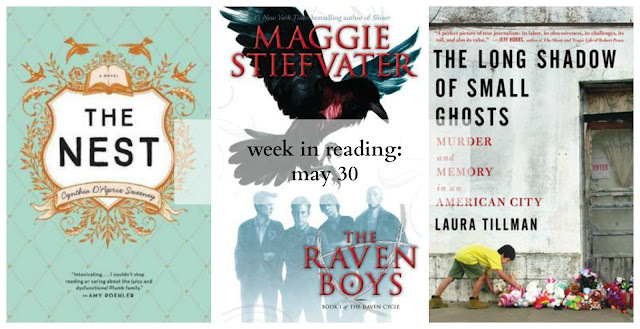 And for some diversity in my reading, I'm also picking away at The Raven Boys, by Maggie Stiefvater, because Shaina and Jenny and others told me to. And then there are the many summer galleys staring at me, which I currently find too overwhelming to contemplate. I've got ice in my coffee and sun on my balcony, so that will be all for now. Here's to a week of wonderful reading. And don't forget to sign up for this month's Social Justice Book Club! The Social Justice Book Club is an informal group read of a social-justice related book. For June, we're reading The Long Shadow of Small Ghosts, by Laura Tillman. Come join us!